“Association Integro” was registered in 2002 as a non-profit organization under the legal non-profit organization. The association’s activities is aimed to build structures of active citizenship in Roma communities, uniting the efforts of these structures for adequate gm diet plans representation of Roma at all levels of decision-making and responsibilities and create conditions for dialogue and cooperation with local authorities and national institutions. Amalipe Center for Interethnic Dialogue and Tolerance is a leading Roma organization, working for the equal integration of Roma in Bulgarian Society. The organization plays a central role in organizing a Roma civic movement and advocating for Roma integration within the state institutions. Amalipe believes in the equal integration of the Roma people in society by focusing on the preservation of the Roma identity and on the modernization of the Roma communities. Areté Youth Foundation is a 501(c)(3) organization supporting high-potential youth who are limited by social and economic barriers in Bulgaria and the Balkans. We envision a Roma community of engaged citizens and positive role models who support each other to achieve educational, financial, and personal success. Our Mission is to build sustainable social networks that encourage educational pursuits, instill a culture of giving back and promote mentorship. Student Society for the Development of Interthnic Dialogue – We are a non-governmental and politically independent organization. Our mission is to realize a complete social-educational cycle for the young Roma – popularization of education, carrying out pre-application preparation for entering high schools, carrying out pre-university application preparation, organizing scholarship competitions, motivating young people to acquire the highest possible degree of education, dissemination of information on competitions, scholarships, qualification courses, apprenticeships. The organization Drom is a Vidin based non-governmental non-profit organization and aims to support the integration of Roma within Bulgarian society, thus helping the process of democratization and European integration. In 2000 the organization started the desegregation process with the idea to provide free access to quality education for Romani children from the all-Romani segregated „Nov Pat” quarter to the mainstream schooling system. The mission of Roma Destiny is to help the personal development and social integration of children, youth and adults from Roma origin; to promote the equal access of the Roma to quality education, employment and social services; to promote convergence of ethnic groups in the region of Stara Zagora and nationwide, and to build the spiritual values and the virtues of the civil society by implementing programs and developing partnerships. Roma Destiny connects the different generations with one purpose alone – the Roma to have a better future and Bulgaria to become a model in the area of the uniting of the different ethnicities. Creating Effective Grassroots Alternatives works for capacity building in different levels, changing attitudes and improvement of policies for social inclusion of disadvantaged communities. The organization works in 4 main fields: 1) Capacity building for social inclusion of disadvantaged communities; 2) Improvement of policies for social inclusion of disadvantaged communities; 3) Changing attitudes for social inclusion of disadvantaged communities and 4) International development. Young people are cross-cutting priority target group in all fields and activities. The Association Youth Club “Roma Stolipinovo” is youth oriented non-governmental organization established in 1996. The vision of the Youth Club is to improve the quality life and social inclusion of the Roma youth from Plovdiv and its district through implementing sustainable mechanisms for building capacity, increasing the potential and the self-confidence of the young Roma. The priorities of the Association are focused on changing the negative attitudes towards the Roma and other ethnic minorities through active participation and engagement of the youth from those societies in the social and cultural life of the country, promoting human rights, education and protection. My name is Anita Vodál, and I’m a trainee lawyer at the Hungarian Civil Liberties Union. I came to the U.S. through an international community organizing exchange. My previous intention was to learn how to combine legal empowerment with community organizing back in Hungary. Surprisingly, I learned that you cannot empower people without organizing them – making them aware of their own power. I was so absorbed in the issues and social problems of Hungary that I didn’t have much time before I arrived to think about how things would be in the U.S. I spend most of my time in the “world as it is,” instead of the “world as it should be,” which means that I was complaining about social injustice all the time without taking any action. 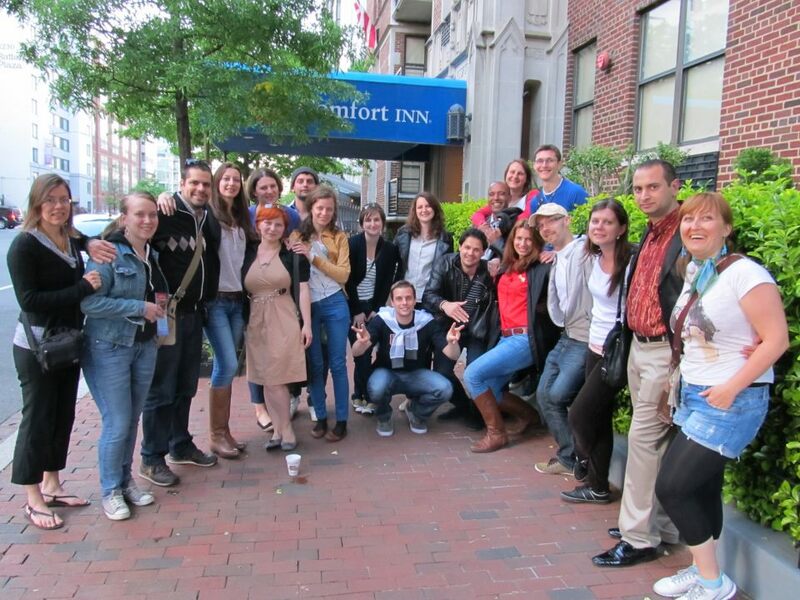 Five weeks ago, I arrived in the U.S. with 18 other fellows from Central European countries with the enthusiasm to learn community organizing and how grassroots democracy functions. Our training included a three-week internship during which our group split up and each of us went to different organizations in various states across the country. We all work with minority groups back in our countries (Bulgaria, Hungary, Romania and Slovakia) as part of the legal, social worker or organizing staff. 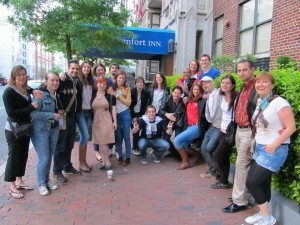 I was placed for my internship at the Chicago Coalition for the Homeless (CCH), along with Miro Ragac from Slovakia. This exchange program, funded and organized by the U.S. State Department, also allows community organizers from the U.S. go to Central Europe in order to learn how things work there, how powerful organizations operate, what are the biggest social challenges organizers have to face, etc. Europeans try to get the same answers from American organizations and participants during the six weeks spent in the U.S. I was completely aware that there are homeless people on the streets in the U.S. too, and that people are concerned about various social issues. However, I never thought that Americans struggle with the same challenges as we do in the middle of Europe – after 40 years of Socialism – nor that in the U.S. people also have to fight for democratic values and against racism. I had to realize that discrimination remains an issue even if we are across the ocean in a country ruled by a democratic leader. It seems to me that this struggle is something that we have to fight for, no matter where we live. In Hungary, Roma people are the biggest ethnic minority, or about 10% of the entire population. The Roma community faces an enormous level of discrimination in every facet of life, including housing, employment, and education. They live in very poor living conditions, lots of them have no running water in their houses, the unemployment rate is almost 90%, and most of the Roma children go to segregated schools or classes. The far-right political party, Jobbik, has 20% of the representatives in the Parliament. This ruling conservative government supports the idea of “gypsy criminality.” This concept has significantly increased the level of racism experienced by Roma people in the last few years. During my stay I the U.S., I have realized that this country also faces serious problems of discrimination and segregation, even though it is ruled by a democratic government. I would like highlight the issue that surprised me the most. If a person has a criminal background in the U.S., they have to carry this felony through their entire life as a stamp on their forehead. It stays there forever; anyone can have access to their criminal record. Related to homelessness, these people are excluded from public housing through the Chicago Housing Authority for at least five years, and have to wait at least another couple of years on the housing choice wait list until they can access an apartment. They cannot rejoin family living in public housing just because of the felony. They can hardly get a job, since their future employee can easily do a background check on them. What is the point of letting people out of prison if they are excluded from most services and their fundamental rights are curtailed? In Hungary, you can get rid of the felony after a certain amount of time, depending on the crime. There are some extensions, but in most of the cases your criminal record becomes blank and nobody can check it except certain authorities. It is your private information. It seems that there are regulations that are more humane in Central Europe and the U.S. has to improve.